Get the accolades you deserve! All that great work you and your colleagues produced in 2017 deserves recognition. It deserves applause. So submit your entries now! Carefully read the Prix d’Excellence categories and the revised Entry Instructions. Check the FAQs for guidance and answers. Plan to submit your entries by February 28, 2018. Best of success to all entrants! The Prix d’Excellence would not be possible without a large number of committed volunteers who serve as category host coordinators and judges for the 2018 competition. Judging takes place through the month of March. Please consider serving as a Prix d’Excellence volunteer. Judges get the inside track on Canadian advancement’s best work in their category. It’s a rewarding way to learn the latest techniques and gain inspiration for your own work. Avoid volunteering to judge any category in which your school intends to submit an entry. Chair of the Nominating Sub-Committee, Past-President Jason Moreton, invites CCAE members to consider recommending a colleague or themselves to serve on the CCAE Board of Directors or on any of its committees. The deadline for expressions of interest is Friday, February 16, 2018. More information and the on-line nomination form are posted on the CCAE website. For any questions, please contact Mark Hazlett (haz@ccaecanada.org). In the past 20 years, dozens of advancement careers have launched and an equal number of advancement shops have flourished thanks to the TD Insurance Fellowships in Advancement. To celebrate this milestone year of the TDI Fellowships, generously supported by TD Insurance since 1998, CCAE is proud to profile past Fellows. 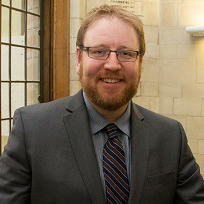 Julian Demkiw received his TDI Fellowship at the University of Saskatchewan in 1998 - 99. He started his career as Alumni and Development Officer at U of S, became Alumni Relations Co-ordinator and then Development Officer, worked in Student Services, and for the past 5 years has served as Chief of Staff, Office of the President. Julian: The biggest thing it taught me was that working at University was a career. Even after 5 years as a student, I didn’t really understand that. It has led me to the point where I am currently working on my Ph.D in Educational Administration (Higher Ed. Focus). Without the TD Insurance Fellowship, I would have taken a completely different path with my life and career. Julian: Always have a career plan but don’t be afraid to deviate from it. You never know where a path may take you; trust you gut and focus on the work that brings you the most joy.